Today Seraphim had went out to walk the grounds while saying his rosary and I was out on the deck at Anna House sweeping off the hundreds of ladybugs. I glanced over toward the Chicken Coop to see what the chicks were doing. With the Spring sunshine heating up the grass, I expected to see the chickens darting about chasing bugs, scratching and pecking. But instead, I came across a sight that took me back. It took me back several years to another place and time - a difficult time except for this one fond memory. At our former place, in the middle of the city, we built a grotto. This provided the perfect setting to say the Rosary. Night after Night, Day after Day we said the rosary at the grotto. 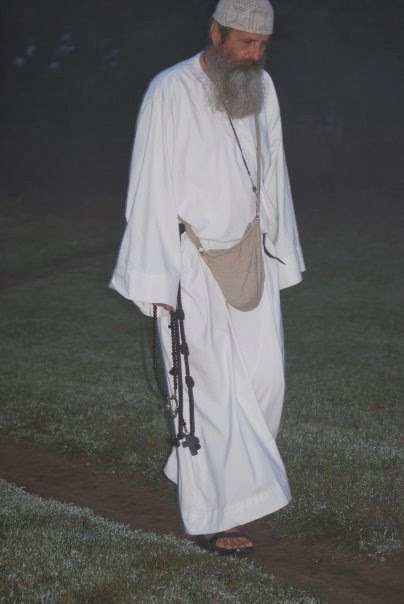 As America went into Iraq during the war, Seraphim began Walking around the Grotto praying the rosary. The deeper and more difficult the war became, the more Seraphim walked in prayer, walking the path he prayed and praying the path he walked. 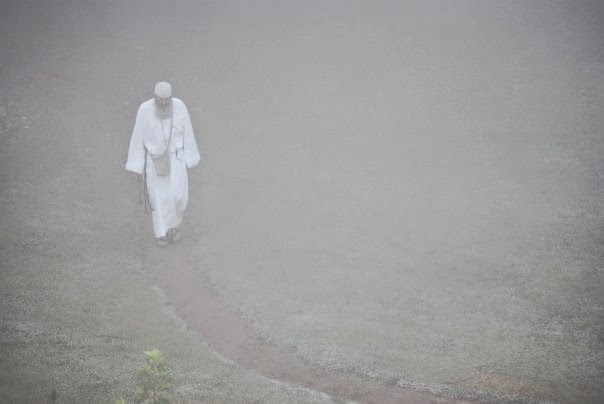 Soon a visible path began to surface, a path made completely out of prayer. The prayer path hadn't been planned, it just happened. Saying the rosary while walking engages all the senses, the movement, the sights and sounds around you, verbalizing the clauses out loud, breathing the air - it all helps to deepen your prayer, and in the case of the Rosary it deepens the Life of Jesus within you. "If you want to understand the Rosary, its praying the Life of Jesus. If you want to understand Mary, its saying "yes" to that Life. Therefore the Rosary is praying the Life of Jesus in union with Mary who said yes to that Life." - Seraphim. Later we were excited to find out that John Bradburne the Franciscan, martyred during the war in Zimbabwe, also had a prayer walk he called the Prayer Track up on top of Chigona Mount. At certain times, others began to come to walk the Prayer Path and the Grotto Area became a Sacred Space in an Urban Place. There were a lot of struggles, battles won and lost at that former place but the Grotto Enclosure was the biggest source of comfort to a lot of us. Walking into that Sacred Space felt secure, like climbing up onto the lap of Jesus and taking a big sigh of relief. You could breathe easy there. It has been the one thing I have missed since we moved to the skete. From time to time, we've talked of building a grotto. But that takes, time, labor, money and energy. A project sitting on the "back burner" waiting to bubble forth. beads clicking one after another. In his hands (as is always the case when he says the Rosary - thanks to Fr. Gabriel Harty) his rosary and his Bible. The Bible and the Beads. We, at St. Simeon Skete, have taken to heart the words of Fr. Gabriel, "If you want to get back to the source of the Rosary, to its origin we would need to open the Scriptures. That is why I like to bring together the Bible and the Beads, the two together." Fr. Gabriel Harty, O.P. Upon Seraphim's return to Anna House, without any other words I asked "Are we starting the prayer path?" "Maybe", he said, "maybe we will." And so this time around the prayer path will come first and as we can, we hope to add the Grotto, but for now it is enough to watch as the prayer reveals the path. "Thou wilt shew me the path of life: in thy presence is fulness of joy; at thy right hand there are pleasures for evermore." - Psalm 16:11.